For other people named Philotheus, see Philotheus (disambiguation). 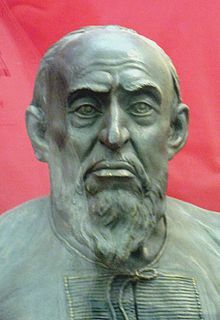 Philotheus (or Filofei) (Russian: Филофей) (1465–1542) was a hegumen of the Yelizarov Monastery, near Pskov, in the 16th century. He is credited with authorship of the Legend of the White Cowl and the Third Rome prophecy, details of which are very scarce. He is popularly known as the presumed author of the concept of Moscow as the Third Rome, which sets out the thesis in his letters. In reality, these letters are mainly devoted to other issues, mostly talking about Church issues, and only refer to Moscow or Muscovy rather obliquely. Their main message in this regard is rather to remind the tzar about his ecclesiastical position of Protector of Faith, as the two previous capitals of Orthodoxy, Rome and Constantinople, both fell, first to the Latin heretics, and second to the Muslim heathens, with Moscow remaining its sole bastion. Philotheus prophecy could then best construed that the Muscovy (or Russia in general) will stand as far as it remains true to the Orthodox faith. His essays "On the Grievances of the Church" to Ivan the Terrible, refuted by scientists, as it contains elements of controversy with the first epistle. Philotheus tied the "Third Rome" to protection of property rights of the church. In August 2009, it was reported that archaeologists had discovered a Pskov grave, allegedly belonging to Philotheus. Wolter von Plettenberg was the Master (Landmeister) of the Livonian Order from 1494 to 1535 and one of the greatest leaders of the Teutonic knights. He was an important early Baltic German. Pskov, known at various times as the Principality of Pskov or the Pskov Republic, was a medieval state on the south shore of Lake Pskov. The capital city, also named Pskov, was located at the southern end of the Peipus–Pskov Lake system at the southeast corner of Ugandi, about 150 miles (240 km) southwest of Nevanlinna, and 100 miles (160 km) west-southwest of Great Novgorod. It was originally known as Pleskov, and is now roughly equivalent geographically to the Pskov Oblast of Russia. It was a principality ca. 862–1230, after which it was joined to the Novgorod Republic. 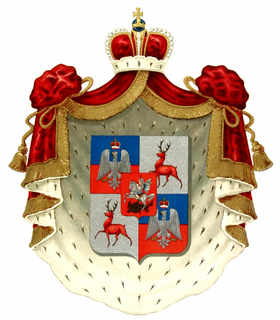 From 1348, Pleskov became again independent from Novgorod and established an aristocratic oligarchy. The Legend of the White Cowl is a Russian Orthodox story first recorded by the monk Philotheus of Pskov in 1510. It tells of the passage of a religious relic of great significance through great danger from Rome to Constantinople and finally to Moscow, at a time that many Russians believed the pre-eminent Christian Church in the world to be transferred in Moscow. Andrey Vasilyevich Bolshoy, nicknamed Goryai, was the third son of Vasili II of Russia who transformed his capital in Uglich into a major centre of political power and ensured the town's prosperity for two centuries to come. He was called Andrey Bolshoy to distinguish him from his younger brother Andrey Menshoy. Yelizarov or Yeleazarov Convent is a small convent founded as a monastery in 1447 to the north of Pskov, along the road leading to Gdov, by a local peasant named Eleazar. He constructed the wooden church of Three Holy Fathers, wherein he was interred upon his death on 15 May 1481. Eleazar was canonized at the Stoglavy Sobor in 1551.